IN THIS FAST PACED WORLD, IT’S LIKELY OUR PATHS MAY NEVER CROSS AGAIN. So what if they don’t? In a world of cheap promises of wealth, health, and happiness, I’ve discovered something that has made a lasting difference in my life—and I’d like to share it with you. You don’t need to be somebody special to make this discovery yourself. I’m just an ordinary person. But one day I found that there was something more to life than living for weekends, working a lifetime to stay ahead of bills, growing old, and finally . . . death. From the beginning of time, according to a special book called the Bible, life was meant to be a richly satisfying experience. The purpose of life even included friendship with God himself! In fact, God created man and woman to enjoy his friendship in a perfect world of love and trust. God created humankind in his own image (Genesis 1:27). He shared with them qualities similar to his own— intelligence, conscience, personality, speech, the ability to choose. The things that still give our lives meaning today. Despite a great start, there came a time when the first man and woman, Adam and Eve, chose to go against one of God’s instructions to them. The consequences were immediate. Their sin—the choice to disobey God—broke their once-close friendship with him (Genesis 3). Even worse, sin’s eventual result was physical death. And death opened the door into sin’s final outcome, eternal death, separation forever from God. And from their day to ours human history can be summed up this way: “Although they knew God, they did not honor him as God or give thanks to him, but they became futile in their thinking, and their foolish hearts were darkened. All have sinned and fall short of the glory of God. The wages of sin is death” (Romans 1:21; 3:23; 6:23). Unfortunately, we have all followed the ways of our forefathers. Disobedience. Deceit. Lies. Using others. Loving money. No time for God in our lives. But God had a solution to the disastrous problems of sin. His plan: Have someone who had never done wrong take the place of everyone who had ever done wrong. An innocent substitute for guilty wrongdoers. Two thousand years ago the plan went into action. Jesus Christ, God’s Son, became one of us. In his 33-year lifetime as the God-Man, he fulfilled every requirement and expectation God ever hoped for us. He never once sinned against his Father or those around him. In other words, Jesus qualified as the perfect substitute for all the rest of us! So his death on a cross was not the tragic end of the world’s greatest teacher. Actually, in dying, Jesus carried through with his desire to take the eternal death penalty for us all. One sinless man for all sinful humankind (Romans 5:8)! Because he is the one and only God-Man, Jesus’s suffering equaled the eternal judgment in hell that we all would otherwise experience. That’s how much he wanted to restore God’s original purpose for us. The Bible puts it this way: “God so loved the world, that he gave his only Son [Jesus Christ], that whoever believes in him should not perish but have eternal life. For God did not send his Son into the world to condemn the world, but in order that the world might be saved through him” (John 3:16–17). Jesus’s resurrection from the dead three days after his burial proved that, in paying the death penalty for us, he had also conquered death, not only for himself, but for all those who believe in him (1 Corinthians 15:1–8). That means those who trust God to forgive their sins will also share in Jesus’s resurrection life forever in heaven (John 14:1–4). There’s more. Those who admit their sins caused Jesus’s death and trust God to save them from eternal judgment, receive that eternal, spiritual life the moment they believe. Jesus put it this way. “I came that they [who trust in me] may have life and have it abundantly” (John 10:10). Those are the basic facts of my most important discovery. Will it make any difference whether or not you agree with me? Look at it this way: If there is no existence after this life on earth, what will you lose by ignoring what I say? Nothing. But if what the Bible says about eternal life and eternal death is true, and you ignore it, you have everything to lose. 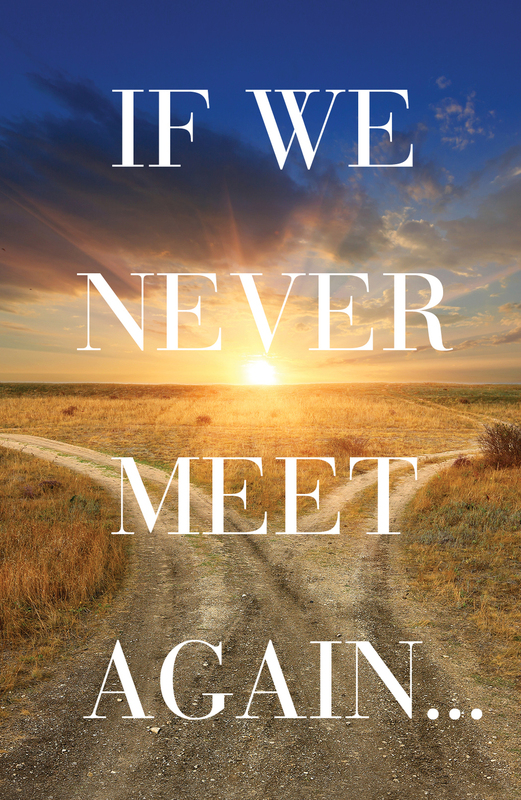 Even though we may never meet again, I don’t have to know you personally to want God’s best for you. But it’s your decision. What will you choose? Dear God, I admit I have sinned against you many times in my life. I’m convinced that Jesus died in my place and took the judgment for sin that I deserved. I receive your offer of forgiveness. I want the new life Jesus promises to those who believe in him. Thank you for providing a way for me to know you.